It seems to me you can never have enough easy to wear, pretty things to put around your neck, even on breeze evenings, they just make you feel more comfortable! Ashlyn is easy and pretty and feminine. The stitches have enough "give" to make the scarflet appear as if it was knitted. The drape and the feel of these stitches is wonderful. Enjoy! If you are a beginner, you will need to know how to do tr stitches, and sc stitches, and how to follow instructions carefully. With Shocking Pink and H hook, ch 74. Row 1- 1 sc in second ch from hook, *ch 1, skip 1 ch, 1 sc in next ch, rep from * across. Row 2- Ch 2, 1 sc in next ch 1 space, *ch 1, skip next sc, make 1 sc in next ch 1 sp, rep from * across. Rows 3 to 22- Rep row 2 for pattern. Ch 1, turn. Row 24- 1 tr in each of next 3 sts, ch 10, skip 10 sts, 1 tr in each of last 4 sts. (Keyhole started) (18 sts) Ch 1, turn. Now we'll work on the decorative ends of our scarflet. Row 2- 1 sc in each of first 2 sts, now, working ONLY in the ch 2 loops, make 1 sc, ch 2, 1 c in first ch-2 loop, *1 sc, ch 2, 1 sc in next ch-2 loop, rep from * across, till you reach last 2 sts, 1 sc in each of last 2 sts. Rows 3 to 24- Rep row 2 for pattern. Fasten off, weave in ends. Join Shocking Pink to narrow edge of scarflet. Rows 3 to 27- Rep row 2. (This side has more rows of Urchin Stitch to compensate for the keyhole on the opposite side.) (18 sts) Fasten off, weave in tails. Love this new pattern! I need to try it soon and have bookmarked it. Thank you +Roberta Mendes, wish you the best with your blog! Thank you so much +Recycle Cindy! 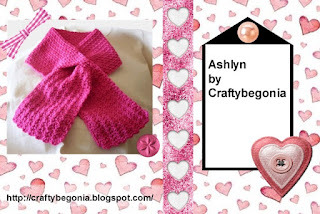 Ashlyn is quite easy to make but it looks great. I sent you a PM and posted a question on Crochetville as I was wondering about the yarn. Did you use a 5-6 ounce skein to work the scarf? I was wondering as I didn't know the amount of yarn needed. Let me know if you can. Thank you. Hi +RecycleCindy! I'm sorry you had to wait fr an answer, I have tons of things to do and have not been on Crochetville in some days now. For the original, I used less than a full skein of worsted weight Red Heart Super Saver in the color indicated. Maybe you can get two scarves from one skein, because I had quite a lot of yarn left when I finished. Hope this helps! Thanks for the info and I ended up using a pounder before I saw your reply as I wanted to get started. I ended up using 3.6 ounces of yarn and did a few extra rows on the decorative ends to make it a bit longer. On second side at end of row 1, I believe should be only Ch 1, turn; rather than Ch 4. Anyway it all worked out nicely and I enjoyed the pattern. Glad to hear that +RecycleCindy. Will take a look at that row. Glad the proect turned out pretty for you and that you enjoyed the pattern.